JULIE SCHULENBERG RECOGNIZED FOR 25 YEARS WITH CLEARY BUILDING CORP.
VERONA, WI – In appreciation for 25 years of service to Cleary Building Corp., Julie Schulenberg, Front Receptionist at Cleary’s Corporate World Headquarters in Verona, WI, was recently recognized and presented with an Anniversary Certificate and a custom-engraved silver & gold watch. Over the course of her tenure at Cleary, Julie has made a valuable contribution to the growth and success of the company. Cleary Building Corp. would like to thank and congratulate Julie for her loyalty and dedication for the past 25 years. Julie lives in Mount Horeb, WI. “Julie has been an integral part of Cleary and the Verona team for many years,” said Cleary Financial Analyst Kathy Knoble. “Julie’s positive attitude and amazing work ethic has always been exemplary, and for that we are proud to recognize her for 25 years of dedicated service to Cleary. 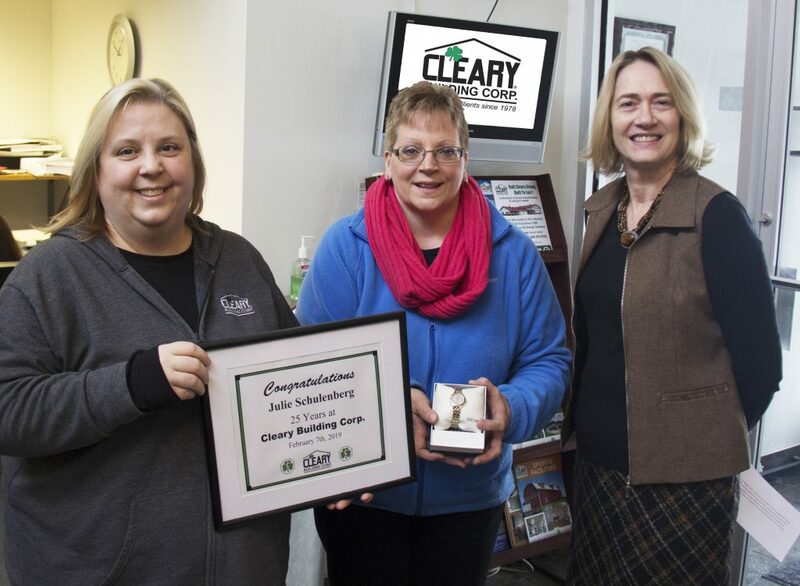 Pictured above, from left, Cleary Administrative Supervisor Marian Metcalf, Julie Schulenberg, and Cleary Financial Analyst Kathy Knoble at Cleary’s Corporate World Headquarters in Verona, WI. Cleary Building Corp. is a family-owned company in business since 1978! The Corporate World Headquarters and area manufacturing facility are located in Verona, WI. Additional manufacturing facilities are located in Grand Island, NE and Hazelton, ID. Cleary Building Corp. employs over 800 full-time employees throughout the United States at 82 branch offices. Area Construction Leader Hits Milestone: 91,000 Buildings Sold! Copyright © 2019 Cleary Building Corp.